Spring cleaning before heading north. The tools from the spring cleaning tool belt. All that is missing is the baking soda, already in the frig. 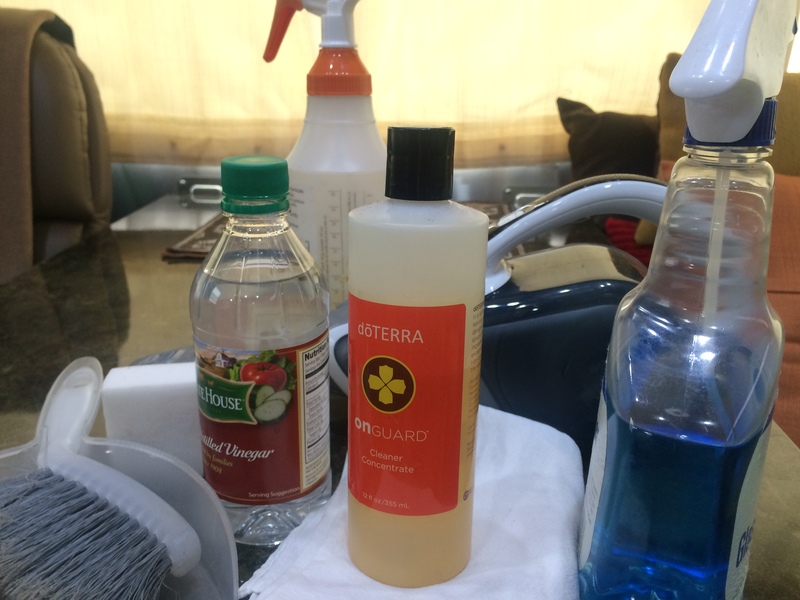 Each year, in springtime, I commit to a comprehensive T2 cleaning. It’s usually spread over a few days with Day 1 always starting with the triannual refrigerator defrosting. Perhaps it’s because it is my least favorite cleaning task and I know that once starting it, I have committed to the no-turning-back process. The best part is the ritual that ends with putting the fresh new box of baking soda in place and writing the date on the duct tape patch on the inside the refrigerator door. Collecting pottery shards of our pilgrim life. Pottery shards in situ. Photo credits: oldpueblo.org. 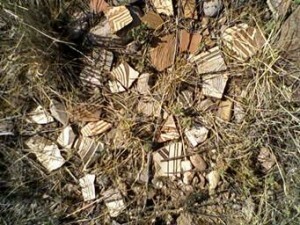 A fellow Airstreamer recently posted a blog (Life on the Blue Highways) with a picture of some pottery shards that he discovered in New Mexico. These shards struck me as a metaphor for the past few days at Koreshan State Park. Like the shards, each day offered some unique new element in the whole field of our lives here. Celebrating my birthday with the women of Koreshan in Florida. 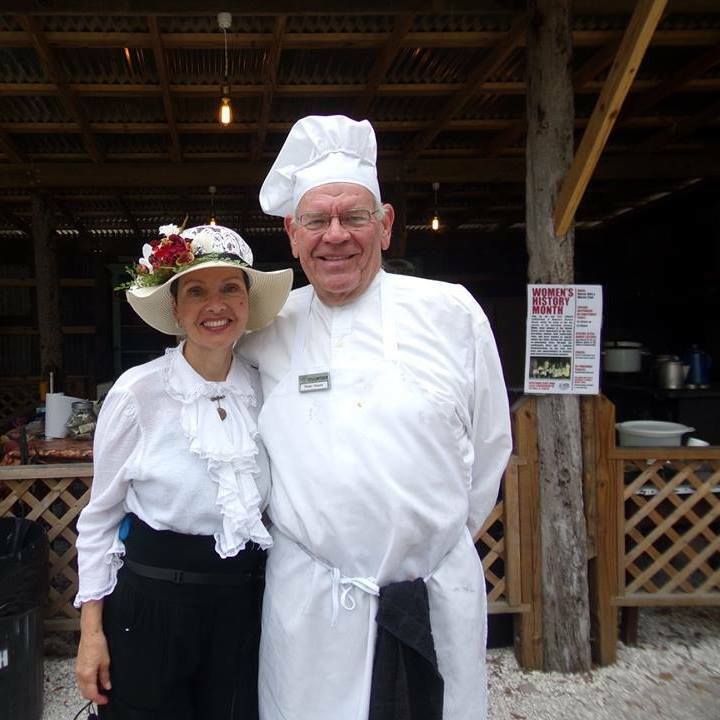 In-costume at Koreshan State Park during Women’s History Month with my favorite baker. The Steinway piano of Estero, Florida. 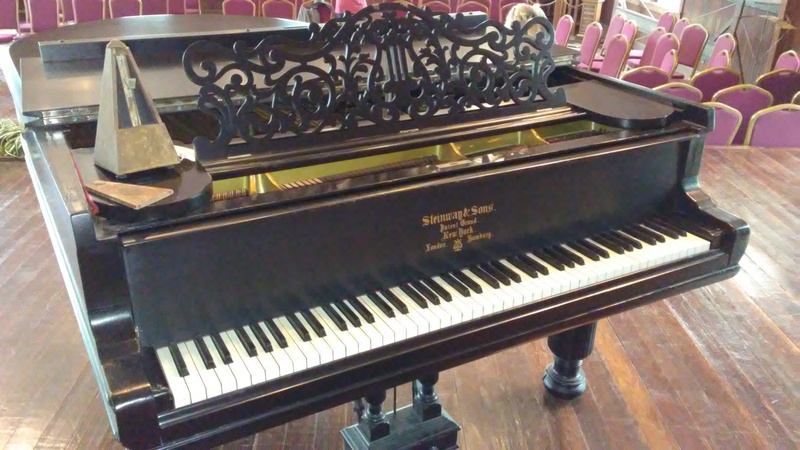 The 1885 Steinway concert piano, with 85 keys, on the stage of the Art Hall. Thank you Ann Mangan for the photograph. Heading toward the sunrise from Utah to Florida. 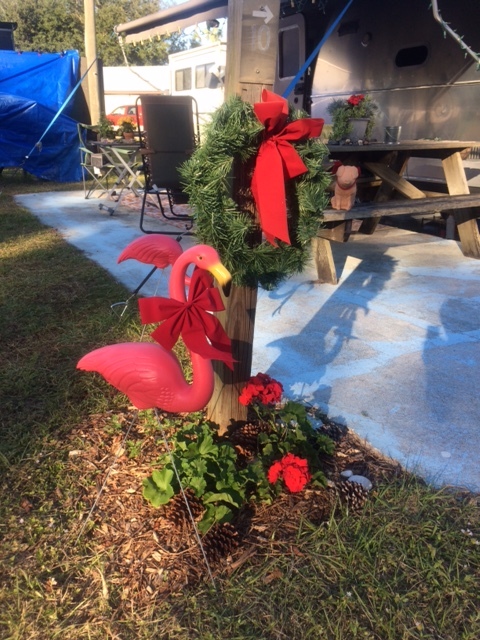 Our campsite in Estero, FL with new Christmas plantings and flamingos in festive attire. Across Nevada to Escalante and Boulder, Utah and the north rim of the Grand Canyon. 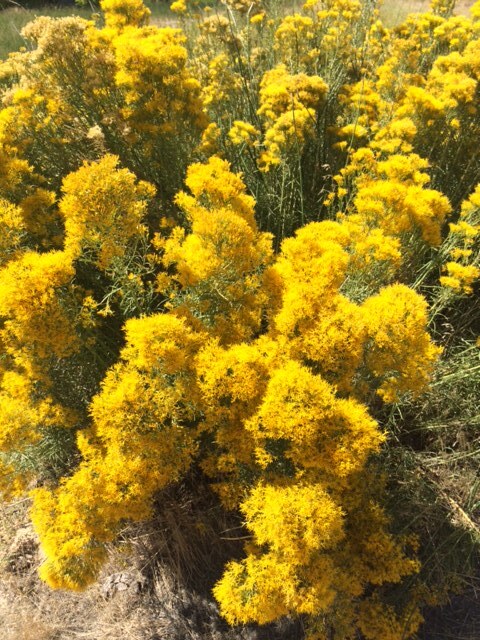 Rabbit bush in full fall colors in Nevada. All along the Oregon coast. Bully Creek Reservoir County Park was a respite and our first stop in Oregon. On September 28, we crossed into Oregon from Idaho, about half way up the state at Vale where the wide open land looks more like high plains of Kansas with grasses and open spaces. 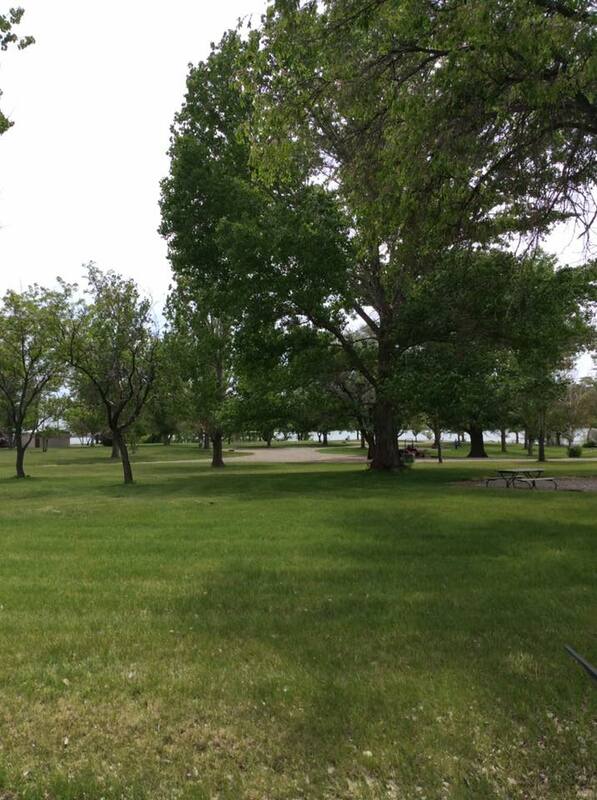 The first night in Oregon, we camped in a quiet county park, Bully Creek, along a reservoir. The day we left, we watched campers arriving and getting set up for the opening weekend of deer hunting season. 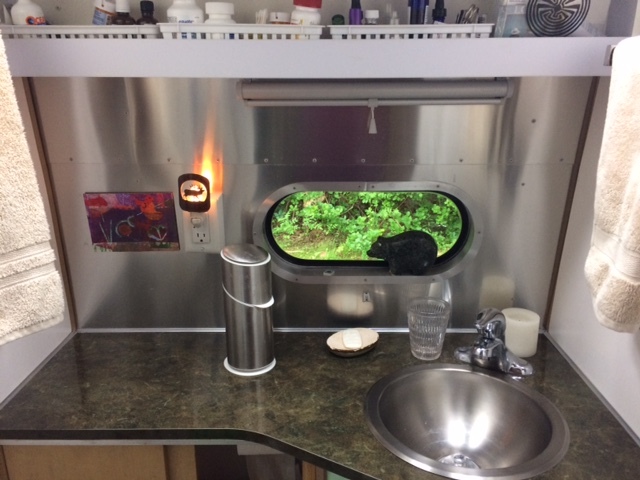 Our Airstream remodeling is completed. We rarely catch those TV reality shows about home makeovers, but Monday, we were actually living one. Exactly one week before, we left our Airstream with the mighty team of Ultimate Airstream in Williamsville, Oregon. This was Phase Two of the renovations we committed to after two years of living on the road. When Ian Harnish, the incredible team leader at Ultimate Airstream, showed us the inside, I just started crying with joy. It was beyond what I could have imagined. The beautiful windows in T2 bring the outside in so when I am writing, views like this (from Minnesota’s north woods in 2016) fill my heart. But we needed to improve the functionality of the living area for our needs. As you loyal readers know, we love our Airstream (named T2). 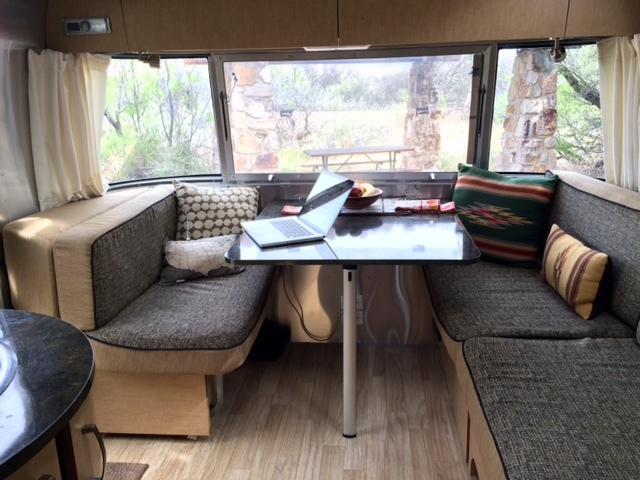 Our experience with Airstream as the manufacturers has been nothing but enthusiastic. But, after twenty-seven months, our love of travel, adventure, and life taught us that there were renovations we needed in order to maximize our tiny and very efficient space. Specifically, we decided that we had no need for extra sleeping space so the long couch and the large dining table, both integral components to more sleeping space, were not priorities for us. We are both avid readers and a comfortable chair became an essential element to peace and wellbeing and the original Airstream curb side bench was not making the grade. We aren’t the kind of people who entertain a lot indoors so the long couch was not functional. 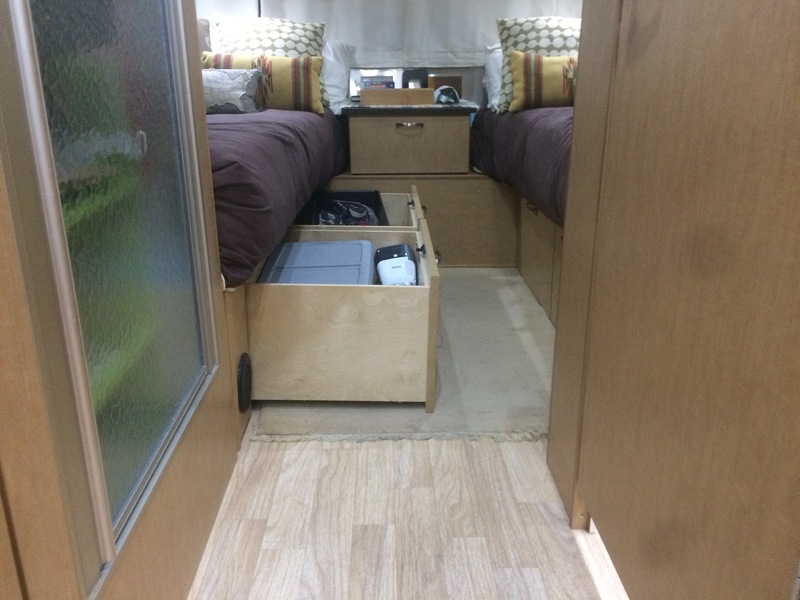 What we did need was more organized storage space inside, much more comfortable seating, and easier access to the under-bed storage that Airstream so brilliantly includes in the front bed, twin models. View out the new window in the bathroom, June 2017. We did include a shade for night privacy. Also added a second towel rack in the bathroom. 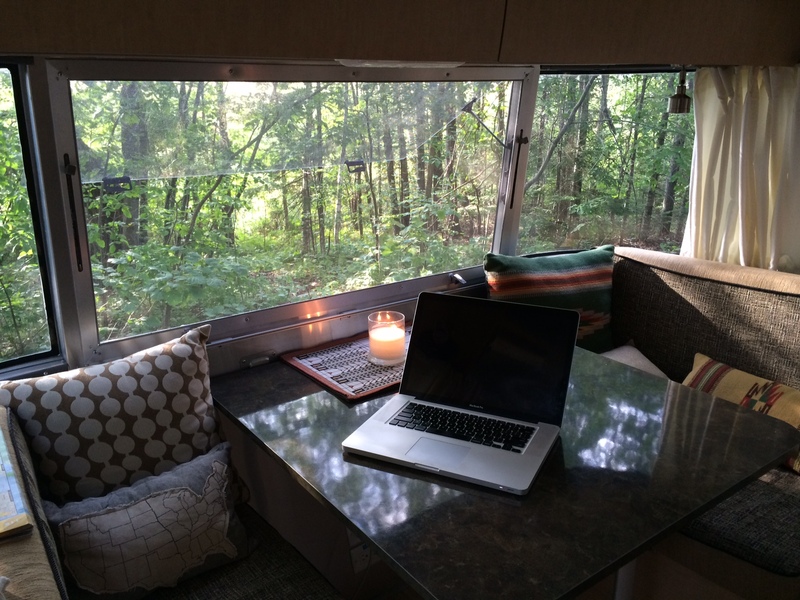 Phase One of the renovations was completed at Airstream in Jackson Center, Ohio in June. They removed the curbside bench and installed our new Lambright wall-hugging recliner pictured below in a couple of images. We also had them cut down the size of the dining table to better fit the recliner and open up the space more. JC also installed a porthole window in the bathroom. We had seen this modification when we were in Death Valley in March and it just blew us away. The picture here tells all you need to know about this improvement to the quality of our life. The bath was functional without the window but with it, the natural light and the illusion of spaciousness of bringing the outside in, is wonderful and the last four months have just re-enforced our decision. Here’s a close-up of the new cabinet which is tucked under the window and up against the wall with the refrigerator. The counterspace on top is amazing and because it is set back it just opens up the entire interior and feels so much more spacious. In October, Ultimate Airstream took over from there for Phase Two. They re-built the seating area completely, removing the original 93″ couch and replaced it with a custom 72″ couch and removing the gaucho slide that offered the option of another bed. (I have inserted before and after pictures at the end of this blog so you can experience the complete make-over). These guys use professional grade upholstery cushions and great vinyl covering that are essential for the intensity of our full timing. These cushions are firm and very comfortable for long periods of sitting (like writing and reading) and that will most likely last a decade. They also designed and built a custom cabinet for us, adding precious storage space and creating an efficient set of storage spaces. The middle cabinet drawers are heavy-duty, 11″ deep (they need to hold a portable filing system) and extend fully for access to the content. 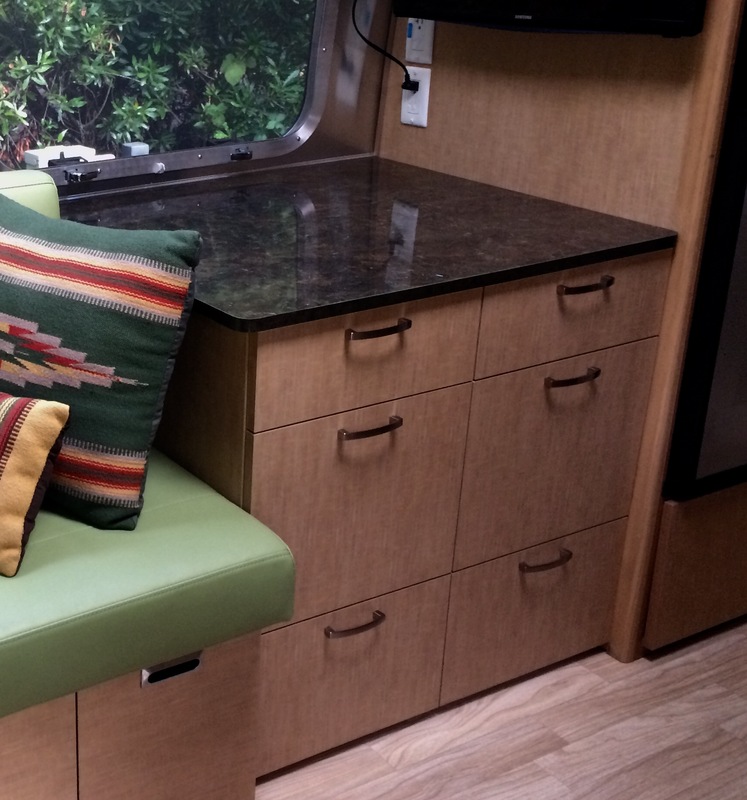 The cabinet materials, including drawer pulls and countertop, are all with the original Airstream materials that are specific to our 2015 and so the finished result is completely seamless. Here’s a picture from the hall looking into the bedroom showing the two new under-bed drawers, fully extended. And yes, they did accommodate the floor rug when building! The other modification we made was to install custom drawers underneath the deeper of the two twin beds in the bedroom. Again, these are super deep and pull out all the way for incredibly easy access from the top to the storage bags of (in this case) sweaters and bulikier clothing items. This is already a life-changing modification as we have re-organized all the harder to get to spaces where seasonal items like hats and scarves got buried in smaller storage areas inside T2 and were hard to access. We opted not to build drawers under the other twin because the space is not as deep (there are outside storage areas located in this general area) so it is far easier to access the contents since the space is so shallow. 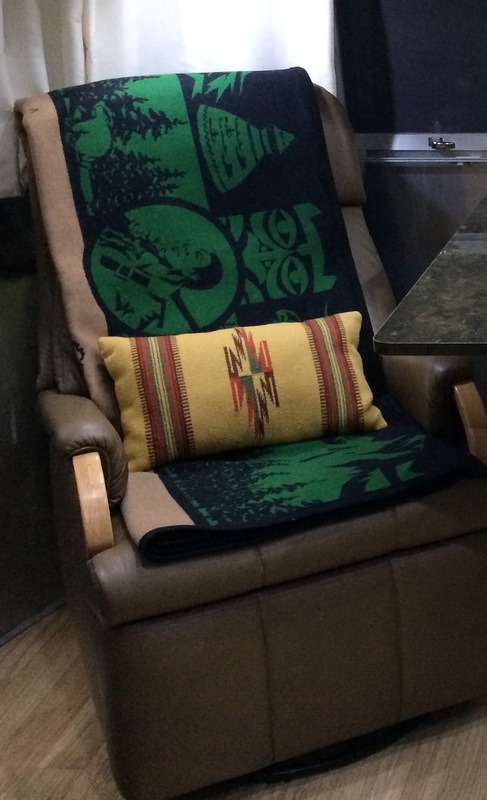 On chilly evenings, we throw our Pendleton blanket over the recliner and all is well! We also made another change this time around. Ultimate Airstream replaced the radio/stereo that came with T2. It never really worked for me and was too hard to use. The new one, a Kenwood car stereo is great and since our Clarion speakers are so good, we can listen to our music and easily watch movies through the system. No picture here of the stereo but know that it’s great. So here are two remarkable pictures of T2. 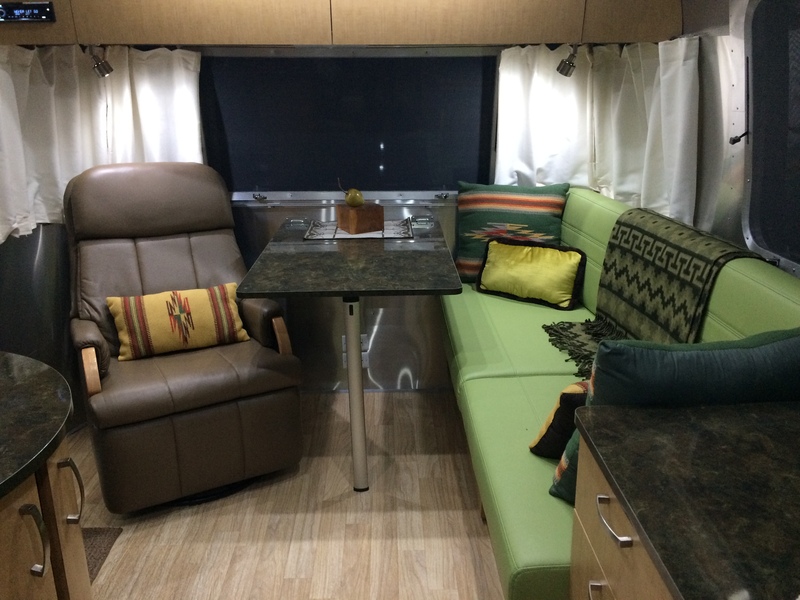 The first, the “before” picture, shows the original set-up with the curbside bench, most of the long couch, and the fabric upholstery that we chose when we ordered the Airstream new in 2015. The original table is oversized and while it did provide a great work space, the trade-off in comfort was not worth the price. And below that is the “after” picture of the new living area showing the gorgeous couch covering, Chimayo wool throw pillows, comfy alpaca throw over the back cushions, and a view of the recliner. The original interior living/dining area. Our newly remodeled living/dining area is fabulous. Liz and Peter are continuing their pilgrimage to here in their newly renovated Airstream, heading slowly south and east and aiming for arriving in Florida by mid-November. If it’s Labor Day, this must be Kansas. 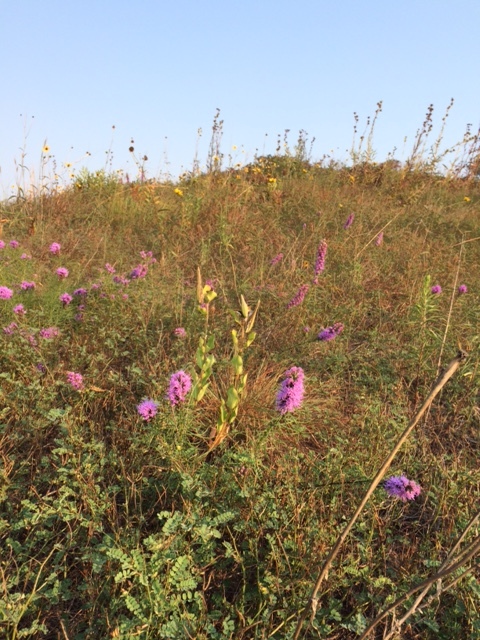 In Kansas, the wildflowers are in bloom in the Flint Hills. 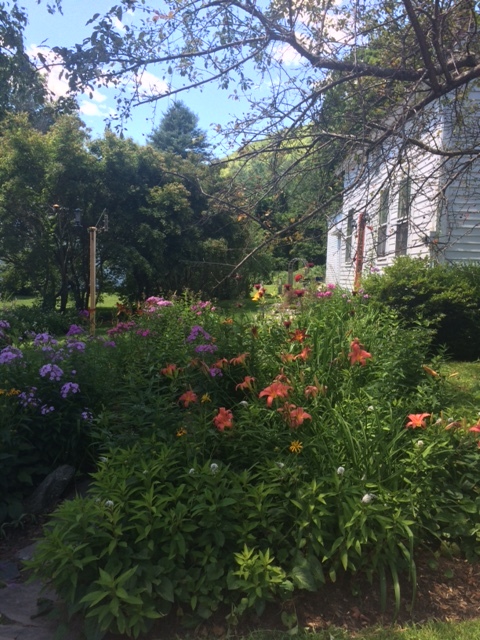 Summer gardens in Newfane, Vermont on a Sunday afternoon. The gypsies have put down roots in Keene, New Hampshire for a total of eleven weeks, which began June 8. The primary objective of this longest-of-stays is ensuring Peter’s successful recovery from hip replacement surgery. Now, nearly three weeks post-op, I am happy to report that surgery went very well and Peter is on the positive curve toward full recovery. The daily progress is astounding and serves to remind us of the gifts of grace where God is in the details. Last week, Peter moved from the walker to his walking sticks during his bi-weekly PT session.